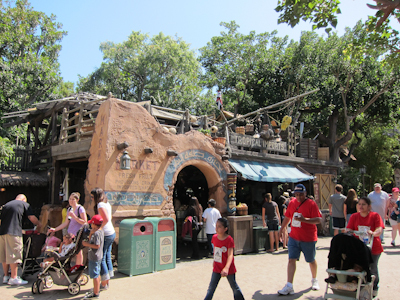 I’ve talked about the Adventureland bottleneck in a couple of different places. It can be frustrating, and that’s really a bummer because there’s SO much to see in just that little stretch of the park. I’ve already covered the geographically confusing South Seas Traders, getting your fortune told (when working) at the Adventureland Bazaar, how to buy a hat at the Indiana Jones Adventure Outpost, the ride I would kill to work on (Jungle Cruise) (and I wouldn’t kill, I’d just shoot cap guns in the vicinity of wagging hippo ears), and the best kebabs in the park at the Bengal BBQ. But there’s still one more detail-filled shop I need to cover–Tropical Imports. 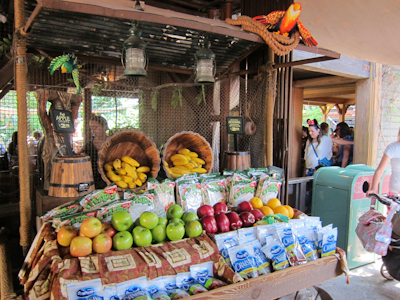 Tropical Imports is an open-air store located as a part of the queue for the Jungle Cruise. The architecture is a little funky, but it works. Man, I really need to be more careful about other people in my pictures. There’s sort of a patio thing above Tropical Imports. I can remember in the past that sometimes you’d see a Calypso band up there, but I haven’t seen that for a while. Any insight, Sharp-Eyed Readers? Tropical Imports has a great sign. I’m not really sure why, but I totally love this sign. The thing that always immediately catches my eye is the display of fruit. 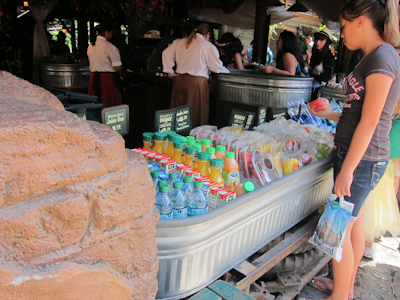 It’s just like the fruit cart on Main Street for your standard apples, oranges, and bananas. They also sell things like craisins. Craisins? 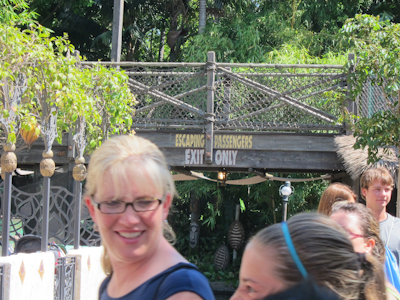 Seriously people, you're at Disneyland. Splurge on a churro and enjoy yourself. A big steel tub? Wow! Yes, it sells bottled water (which you won’t need to buy because you took my advice and brought along a refillable water bottle, and have been getting free ice water at quick service restaurant windows to refill it) and juice, but the best part is in those little plastic containers: fruit. Not boring fruit like apples and bananas, but interesting fruit like mangoes and pineapples and strawberries. And if that isn’t good enough, the fruit, which looks juicy and irresistibly tasty, is sitting in a bathtub full of ice. So you’d like a sweet but mostly healthy treat and it’s really hot out, it’s not just fruit, it’s COLD fruit. Man, it makes me want to buy some now. I’ve always been a sucker for mangoes. 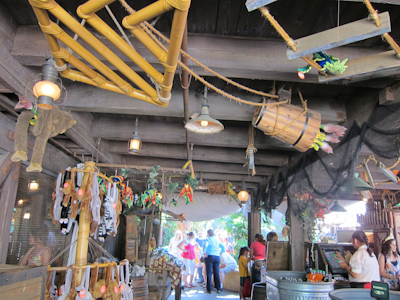 And like the rest of the stores in the Adventureland bottleneck, the decorations on the ceiling are fabulous. 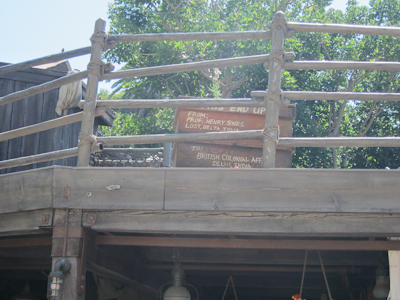 Disney really does an excellent job with the details, even if you can't always figure out what the things are. You can buy stuffed animals to go with your fruit. The monkeys you can mostly see hanging by their arms in the bottle left of the picture. That always looked a little uncomfortable to me, but then again, I’m not a monkey. 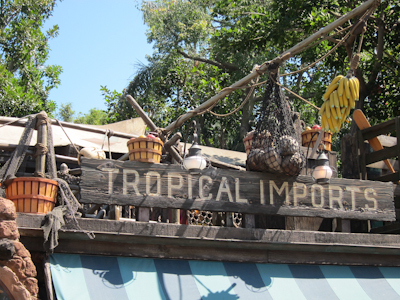 So there you have it–the Tropical Imports store. Now I made you crave cold fruit, didn’t I? Heh. Yes! And I find the mangoes so much more refreshing. 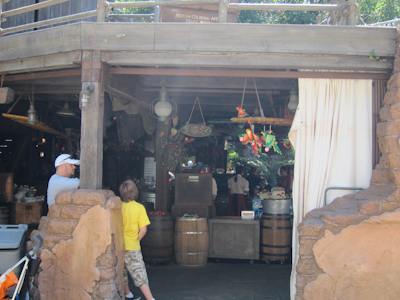 The other fruit I love are the pineapple spears at the Tiki Room too. How funny! Maybe the dip the apples in pixie dust or something. Now if it were me, I would have been whining for a churro ;).